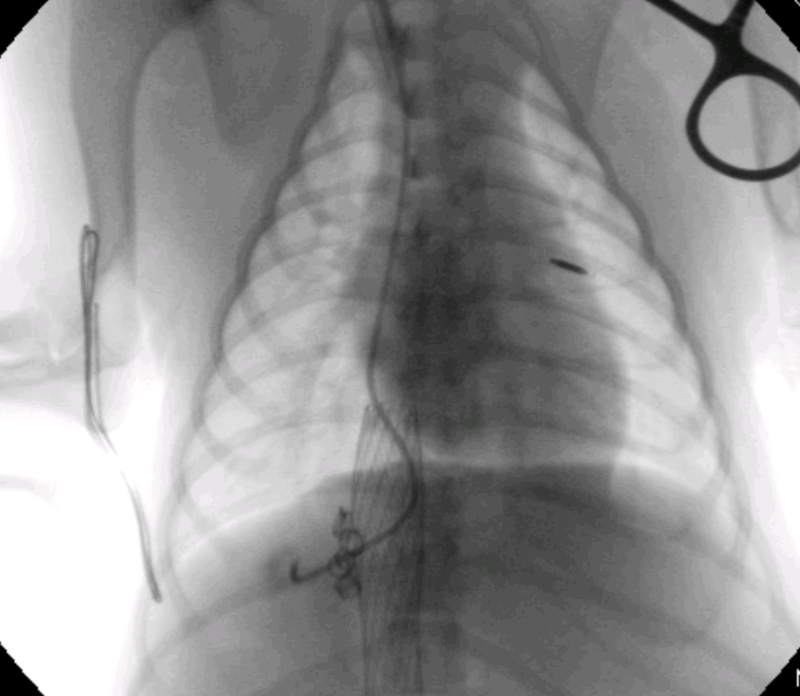 Interventional radiology is one of the most exciting new fields in veterinary medicine. It combines minimally invasive techniques with state of the art imaging to provide successful treatments whilst reducing the patient discomfort associated with traditional surgical alternatives. Interventional radiological procedures commonly performed at Highcroft Veterinary Referrals include intravascular coil implantation to treat dogs with intrahepatic portosystemic (liver) shunts and subcutaneous ureteral bypass system implantation to treat cats with upper urinary tract obstruction. Other avenues that are being actively pursued, in our centre, are targeted intra-arterial treatment of abdominal and nasal tumours, often in situations where conventional surgical approaches are not suitable. These interventions demand superb imaging facilities and expertise in addition to specific training that builds on and complements the traditional skills of specialist soft tissue surgeons. The surgeons at Highcroft Veterinary Referrals have, for example, treated more liver shunts this way than any other team in the UK. These procedures are typically performed entirely through a small skin incision over an artery or a vein and patients usually go home the following day. Highcroft’s Soft Tissue Specialist Dr Ivan Doran will be addressing delegates at the 29th ECVS Annual Scientific Meeting in Valencia in July 2020 where he will be sharing his experience with other surgeons in treating intrahepatic portosystemic shunts using intravascular embolisation. 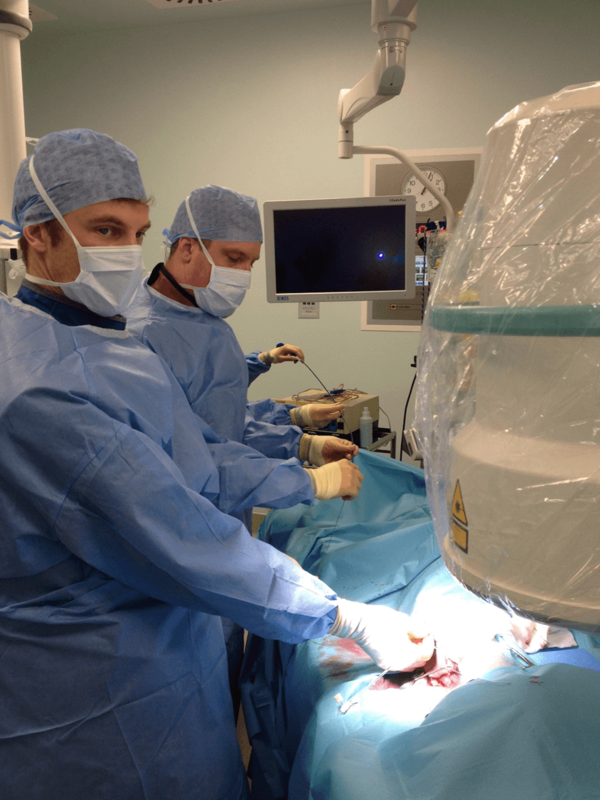 Dr Ivan Doran and Dr Ed Friend perform intravascular coil embolization of a liver shunt in a dog. Protective lead clothing is worn when using fluoroscopy (video x-ray). 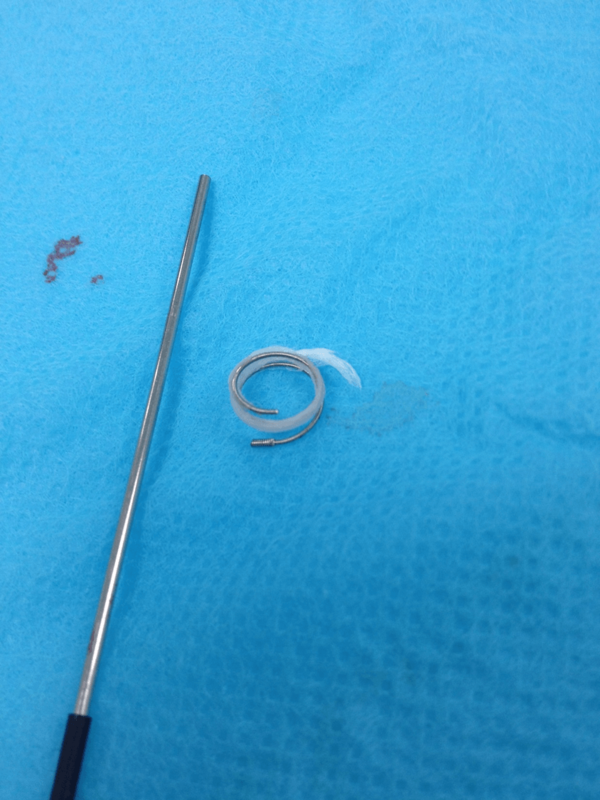 A thrombogenic coil, released from its sheath. The coil’s fibres promote clot formation, which helps to occlude the abnormal vein (shunt) within the liver. Fluoroscopic intraoperative view. A Cobra catheter, passed from the jugular vein into the abdominal circulation, permits delivery of thrombogenic coils into the abnormal vasculature. A vena cava stent (mesh) prevents migration of these coils to other parts of the circulation. (This dog's microchip is also seen in this image).